Mykola Tochytskyi is Head of the Mission of Ukraine to the EU. Russia’s recent open attack on Ukrainian naval vessels showcased that the Kremlin went further from its covert hybrid aggression to blatant military attacks against Ukraine. Russia’s military aggression against Ukraine has lasted for almost 5 years. Russia illegally occupied Crimea and a part of Donbas. About 11,000 people have been killed. All this time the Kremlin denied the fact of military aggression against Ukraine and used the tactics of lying and twisting facts resorting to “we are not there” explanations. But on 25 November 2018 everything changed. The inability of the international community to translate their “concern” into efficient deeds to hold the aggressor accountable, gave Russia a free hand to do whatever it wants, to cross all possible red-lines, disregard the rule of law not even trying to hide this. The Russian military aggression de-facto expanded from the land to the sea. On that day, three vessels of the Naval Forces of Ukraine were carrying out a planned transit voyage from the port of Odessa to the port of Mariupol on the Azov Sea. 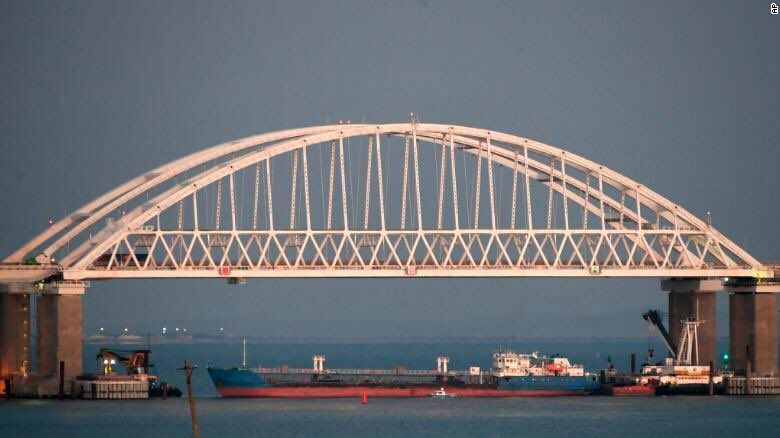 As Russia blocked the passage thought the Kerch strait and its coastguard ship intentionally rammed into one of the Ukrainian vessels, it became clear that they were not going to be able to pass through. Therefore the Ukrainian Navy ships started to head back to Odessa. On their way back Russia’s coast guard opened targeted and unprovoked fire at the Ukrainian vessels. As a result the three Ukrainian vessels were illegally captured and damaged. 24 Ukrainian servicemen have been seized and imprisoned, 6 of them were wounded. The Russian side was informed about the intention to make a transit through the strait in advance in order to ensure the safety of navigation. The Ukrainian vessels operated within the sovereign and internationally recognized state borders of Ukraine. The resolutions of the UN General Assembly clearly recognises the territorial integrity of Ukraine within the internationally recognised state borders, including the Autonomous Republic of Crimea and Sevastopol and the territorial waters around it. The right to unhindered passage through the Kerch Strait is enshrined by the UN Convention on the Law of the Sea and bilateral agreement between Ukraine and the Russian Federation on cooperation in the use of the Sea of Azov and the Kerch Strait. The Article 2 of the Treaty clearly states that “merchant ships and warships, as well as other state vessels under the flag of Ukraine or the Russian Federation, that are exploiting for non-commercial purposes, enjoy freedom of navigation in the Sea of Azov and the Kerch Strait”. Such Russian behaviour also constitutes a clear act of aggression as set out in the provisions of the United Nations General Assembly Resolution A/RES/29/3314 “Definition of Aggression” and is a blatant breach of UN Charter. Obviously the act of aggression in the Kerch Strait with the use of weapons and the capture of Ukrainian vessels and military personnel was planned by the Russian side to “prove” its sovereignty over the Crimean waters. But it also confirms the far reaching goal of Russia to gradually occupy the Sea of Azov and block Ukrainian ports of Berdiansk and Mariupol. In response to an open act of the aggression committed by Russia and given a high risk of further offensive against Ukraine’s sovereignty, the President of Ukraine supported the initiative to adopt martial law on a temporarily basis. The Law was adopted on 26 November introducing a martial law in 10 regions of Ukraine for the period of time of 30 days starting from 28 November. At the time of martial law Ukraine remains committed to its international obligations, including the Minsk agreements. The constitutional rights and freedoms, including the freedom of speech, of the citizens of Ukraine will not be restrained. The martial law will not affect the electoral campaigns in Ukraine – the Parliament of Ukraine set the date of the presidential elections for 31 March 2019 as foreseen by the Constitution. The bank and financial system will conduct their routine work. We are grateful to our international partners for quick reaction with statements and condemnation of a new act of Russian aggression against Ukraine. But it is only with consolidated resolute actions (not statements) that we can make the Kremlin to return to the framework of international law and stop its aggression. Russia’s aggression in Azov and Black Seas is not only an evident threat to international peace and security but also entails big losses and risks for international shipping business which can face Russian state run piracy in the sea. The most important thing though is that we should not allow Russia to add 24 detained seamen to the list of around 70 Ukrainian political prisoners. We expect Russia without any delay to provide information regarding the captured Ukrainian sailors (legal grounds for their detention; place of detention; injuries and provided medical assistance) as it was obliged by the European Court of Human Rights in accordance with Rule 54 of the Rules. to support of Ukraine’s UN GA draft resolution on the militarisation of the Crimea and the Sea of Azov. Russia is an aggressor, which must be stopped. Otherwise, an attempt to appease the aggressor would lead to the dire consequences. We have already witnessed such tragic examples in the world history. We have to act resolutely if we do not want the history to repeat. I hope Euraktiv will give the same floor it has given to Mrs. Totschytsky to a Russian diplomat. On the face of it, there is no doubt that Ukraine did all it could to provoke a natural reaction from Russia. Ukraine lives from the handouts of the EU and the IMF, that is the USA. Its government is deeply corrupt and infested with neo-nazis. It is the outcome of a coup engineered and supported by the same EU and USA. Why has the West spent so much and keeps spending so much on Ukraine? Because Ukraine performs an important function for the West. It keeps providing food for fodder to the warmongers in politics and in industry. It keeps doing what it can to support the myth of Russian aggression, and to hide the fact that it is the West that attacks Russia, not viceversa. When the URSS disbanded the Warsaw Pact, why didn’t NATO follow suit? Why, after promising Gorbachev that it would not do it, why did the west expand NATO to Russia’s borders? How do you justify that NATO spends on weapons fifteen times what Russia spends and yet accuses Russia of aggression? Why does Euraktiv give space to such blatant propaganda? Perhaps because it gets money from Raytheon? Of course Russia is aggressive, it’s too stupid to be any other way. Putin is losing in the polls, he’s down below 60%, so he has to start a fake a war to unite the public behind him. Remember 1904/1905 hehehehe. Ordinary Russians are suffering under Putin’s dictatorship and they must be freed! They must be told the truth! I am glad I can engage in a discussion on this issue. 2) I am afraid I do not remember 1904- 5. Perhaps you can enlighten me. 3) insofar as Russian suffering under Putin’s, I beg to differ. All statistics prove that under Putin, average income, life expectancy, and all similar indexes of well being have risen. Significantly. As significantly as they had declined under Yeltsin, our beloved poodle. If you can’t find the statistics, I can provide them. I find it odd that this only happens over 6 months after the Russian bridge was formally opened (not event talking about construction phase when the structure already occupied the whole strait), just before a G20 summit when US and Russian presidents were supposed to meet and discuss pressing international security issues, and a few months before the Ukrainian elections. But hey! Benefit of the doubt Ukraine, benefit of the doubt! Anyhow, let’s look at the arguments here. First to qualify that the specific event involving the the Berdyansk, the Nikopol, and the tugboat Yany Kapu, with the Russian Coast Guard as an act of aggression, is a bit much. Since the Strait of Kerch and the Sea of Azov are technically both Russian and Ukrainian internal waters, according to the Treaty on Cooperation Between the Russian Federation and Ukraine on the Use of the Azov Sea and Kerch Strait. Thus, again technically, both country’s vessels, commercial or military, have the right to the freedom of navigation through the strait and the sea, as per Article 2 of that treaty, yes. BUT, technically, freedom of navigation in internal waters is subject to innocent passage, as per part 2, section 3 of the UNCLOS and thus controls by the State’s authorities are legally enforceable in this context when the said authority judges it justifiable. Hence, both Russia and Ukraine could legally enforce such controls in this zone, given that both countries recognize that these bodies of water are part of their respective historical internal waters. If Ukraine did not submit to one such control, on the basis of sticking to internationally recognized borders, when they are de facto controlled by Russian authorities, it would equate to voluntarily endangering peace and stability. Even though we admit that Ukraine is technically in it’s good right – although this is not necessarily as black and white as it seems – this behaviour is downright Maverick and unacceptable. On this topic of the internationally recognized state borders of Ukraine, relating to Donetsk, Lugansk, and Crimea, indeed, they are recognized by most, but as for Kosovo, not every single State recognizes them now as they were before 2014. I would even add that a strong majority of the residents of Separatist Eastern Ukraine Republics and Crimea don’t recognize Ukraine’s authority anymore, given the strong anti-Russian sentiment that has been running in Ukrainian politics for decades. As for illegal intervention and annexation, Russia did indeed appear to have intervened in Eastern Ukraine and Crimea, without formally admitting it. But it did so following indications that the US might have meddle in Ukrainian affairs and provoked, or at least fanned, the crisis. This unofficial occupation/intervention also looks awfully like NATO’s little green men that were spotted in Libya, against UNSC resolutions’ express mention of exclusion of ground forces, or like Saudi Arabia’s occupation of Bahrain during the Arab Spring. Russia thus seems to bend international law to the extreme, or even outright break it, but it does so following in the recent steps of NATO / US forces and allies and in reaction to potential illegitimate actions by a rival. This isn’t new in international affairs, multiple examples of great powers breaking international law to protect their core interests can be seen in history, both before and after 1945. Ukraine here is thus a victim of this sad reality. But should it provoke a conflict susceptible of bringing the two greatest nuclear powers on Earth clashing together over it? Probably not. Meanwhile, Ukraine, like Russia, should refrain from provoking any event disturbing the waters, like it seems the have occurred in the Kerch Strait. Letters of ambassadors, international lobbying, outreach and legal procedures, amply suffice to advance Ukraine’s legitimate claims in the Azov sea and Kerch Strait under international law. No need to provoke military incidents!